It is difficult to escape the heaviness that lingers in the air right now. The tragedy in Connecticut stands in heavy contrast to the "Christmas spirit" that 'tis the season. I have a 6 year old son. It's hard not to see his face when I hear the news and contemplate how this could have happened. It's difficult for me to shut off the questions that come as I think of him ever being in a situation like that. I cannot even begin to process the pain of searing loss if I were dealing with the aftermath as these parents are. I am entrusted these beautiful children, these souls, to instruct and shepherd as they are in my care. It is unfathomable to ponder a moment like that in my classroom. Innocence shattered. Fear unbridled. Ugliness and evil screaming out. I have prayed many prayers over the past few days. Small prayers whispered under my breath as my brain tries to wrap itself around this news. Prayers of gratitude for messy craft tables and sticky fingerprints. Prayers of gratitude for "one more hug" at bedtime. Prayers of comfort for the families experiencing this searing loss and unfathomable pain right now. Prayers of protection for my own children and the children I teach. Prayers for peace that transcend our understanding. For, truly, this is something no one can understand. For the past two weeks I have been sharing this line with my students as we work on our Christmas art projects. It is awe inspiring to me. I think about all the hopes and all the fears from the beginning of time to the end of time, and I try to stack them on top of each other in the tallest tower that stretches higher than the heavens. I then see Jesus, and he knocks it over and they crumble. He came to be Emmanuel and to know and share in our highest hopes and the deepest fears. He came to live with us the mess that is this life, and ultimately defeat those ugly fears. He knew longing like we know longing. He knew pain and loss and brokeness and ugliness. The fears in that classroom in Connecticut alone are too much for my heart and mind to comprehend. And yet, this Jesus, my Jesus, takes those, and the fears of the mothers through the ages, the whispers from the darkest moments of the Holocaust, and all the other crazy painful moments in history, and he carries them on his shoulders. It makes the gift of the cross bigger today. I cannot even sit in the reality of what that classroom must have felt like for longer than a few seconds - it is just too much. Jesus doesn't walk away. He doesn't say, "It is too much." No - he walks towards it. And more. And he carries it and he defeats it. The celebration of the angels and the stars blazing in the sky at His birth make more sense now. Light in contrast to darkness. The hope that arrives in contrast to the darkness that has lingered is just so beautiful. I believe heaven shudders at these ugly moments in history. It aches to see pain and darkness and evil. That moment in time when the plan for redemption was put into motion - that moment when Jesus was born - that was the moment that heaven celebrates that an end to the darkness is near. So, today, I pause to reflect on that beautiful thought. That He came to cover the fears, and to know the hopes. We still see the ugly because we are stuck in the now and not yet. It is not yet perfect, but in the now, we can still see that HE CAME. He entered this yuck, for the purpose of carrying the pain. My dear friend, Tim Timmons, has written two songs that have become my soundtrack for the last few days. They are Christmas songs and they are timely. The first is his version of "Oh Little Town of Bethlehem" with his own flair added in. "Rejoice! Rejoice! Emmanuel, God is here. Rejoice! Rejoice! If God is for us, we won't fear. Rejoice! And, again we say Rejoice!" The second in on the album "A Christmas Together", vol 3 and it is called "Mighty Christmas". The phrase "Merry Christmas" is viewed in our present days as happy, jolly, twinkly. 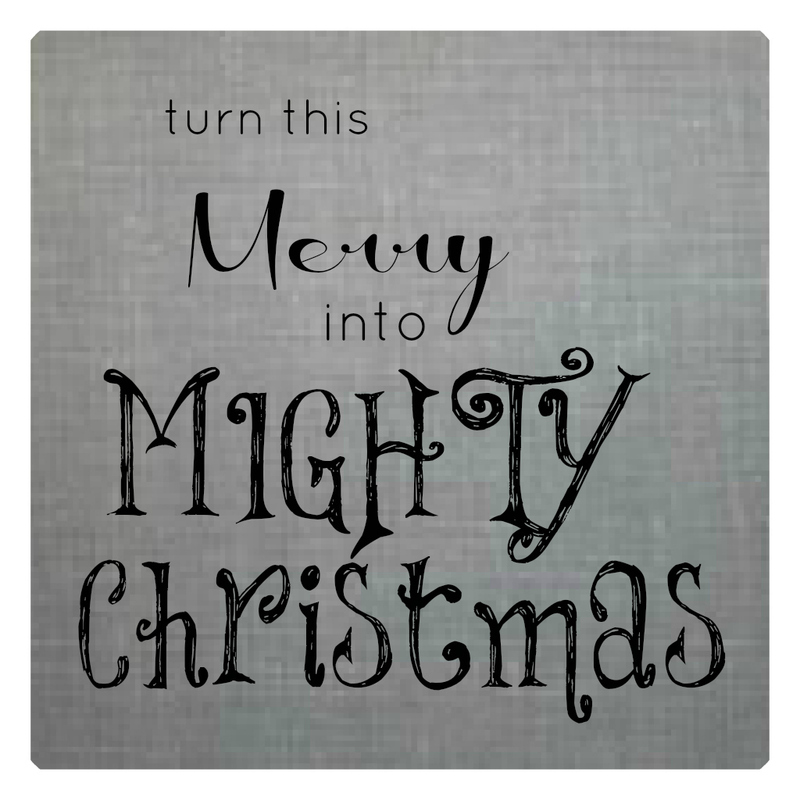 But, "merry" in the old school language was more along the lines of "mighty". Robinhood and his MERRY men were not happy men giggling through the forest. They were MIGHTY men. A force to be reckoned with. This song is all about the need for this year to be different. 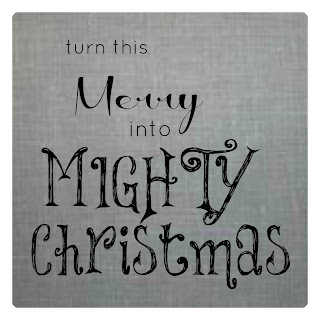 For Jesus to turn the merry into a Mighty Christmas. For the hopes and fears and doubts to be broken by the power that is in Him. If ever we needed a mighty Christmas, I would say it is now. That is one of the prayers I continue to whisper. That God, in the way that only He can, would show up for these families. That He would bring mighty peace and mighty hope into a very dark and broken place. Is this more than Christmas cheer? Is this just a story, what if it's real? Is this still the promise? I am wishing you a mighty Christmas.